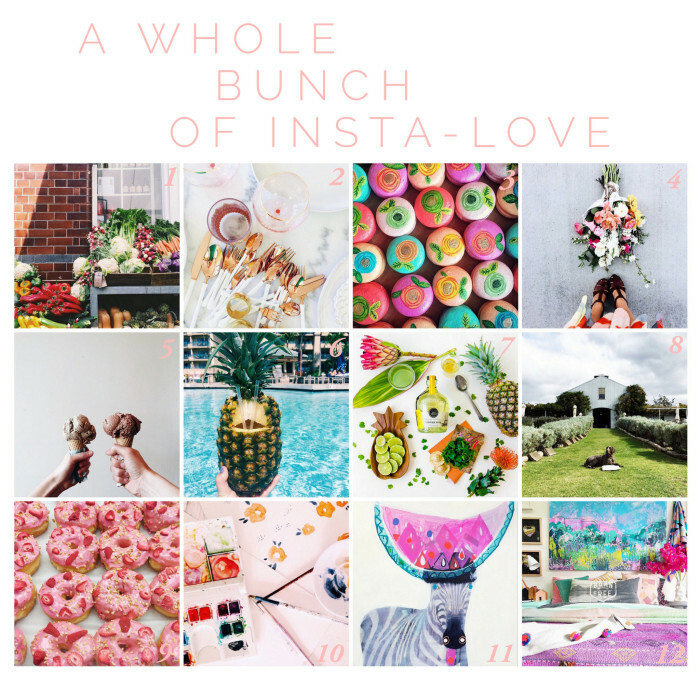 10 Must Follow Instagrams - Add to Your Feed! Everywhere I looked this past weekend, I’ve found inspiration. From the food on my plate to the sunset in the sky I’ve used color, texture and patterns as my muse. Speaking to this, my crew and I have been busy planning a fun Palm Springs inspired photo shoot and we’ve taken to Instagram to find incredible inspiration! Sometimes when I search for images or ideas to ignite my creativity I turn to usual Pinterest hunt – which is all fine and well, but I have definitely become obsessed with checking my Instagram feed like a fiend. Some of the best creatives and makers are all over Instagram looking to collaborate and celebrate your favorite things (no matter what they are – did someone say confetti?!). Here are several of my favorite galleries to casually stalk, enjoy! 1. Claireyclaire: She’s super creative and always has something gorgeous to feature. 2. Hostess Haven: Met this chica at a dinner party recently and her entire brand is perfection! 3. Sweetnsaucyshop: This is the maker of those famous “Hey Girl Cookies” whats not to love?! 6. Pinapplesandcoffeecups: Her feed is so much fun! 7. Layered Vintage: Pretty flower inspiration. 9. Preptista: Maybe my preppy soulmate, she has it all! 10. Shelby Clark: Fantastic photographer and Merchandiser at one of our favorite shops in Carlsbad, Ollie and Me. I love popping in and seeing her, she’s a momma who does it all. 11. Jumbled: My most favoritest (not a real word, I know, but it’s the only word to describe my LOVE for Jumbled) shop for everything really. Decor, inspiration, general fun – go, visit, shop, love. Nice selections. I really liked Hostess Haven the most. I’ll check out the others soon. Thanks! I am already following 3 or 4 of the above Instagram profiles. I must say you have nice collection of Instagram profiles to follow. I would like to check out all the profiles on weekends. I love to follow new trends that help to cherish my lifestyle. I love Instagram. Thanks for these accounts. I am always looking through the search and on Pinterest to find more people to follow. Instagram is a great place to find new friends that have similar, creative minds that you have. Thanks for these 10, I am going to check them out and follow accordingly!